I always know that after Easter it gets really busy at school with the end of the year 🙂 In a few weeks my crazy wonderful kinders will have their step up ceremony and the 8th graders will leave us for high school. It is always fun for me to assist with not only mothers/fathers day gifts but the teacher gifts as well. I always tell my students about the essentials of saying thank you to the people in your life. Even if they just open a door for you its essential to pass along a smile and a thanks. I really believe if we all remembered and did this the world would be a kinder place. I know I need a little reminder once in a while when life gets crazy. Anyhow a truly fabulous parent gave me a box of old wine barrel oak and wanted to see what we could do with it. Naturally I was up for the challenge and had another parent (who is also fabulous) who does a lot of furniture with oak put this cross together for me. Then I had the students come up with one inspiring word that reminded them of their teacher. These students did a truly amazing job. We used a charcoal pencil to write the word first to make sure we could erase it if we made mistakes. Then we used metallic permanent markers to finish them with. I also used one of the metal hearts I had from Christmas wrapping and had a student hammer it to give it dimension and look like it is lifting off the cross. I sealed it with some matte glaze to keep the color locked in. 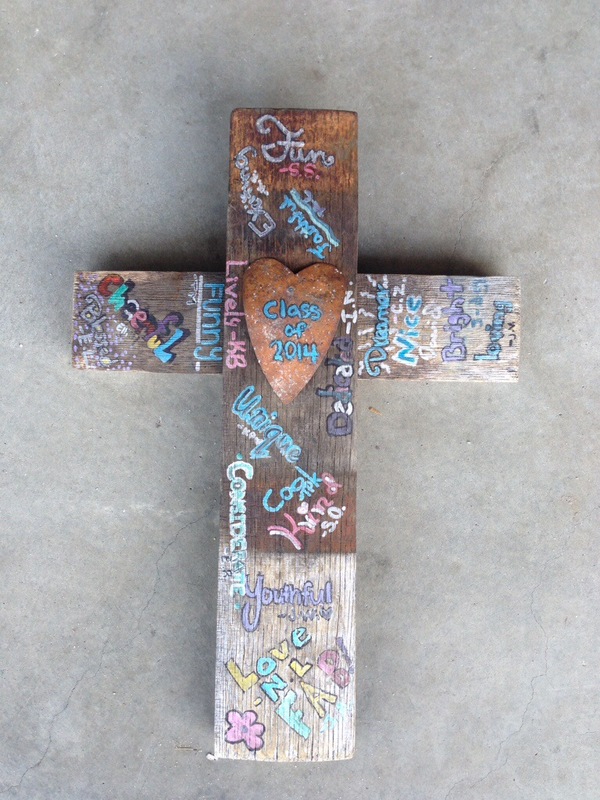 I hope this teacher likes the gift, but alas she has gotten more than just a cross from these students she has learned all year from them and so have I 🙂 Please share with me if you have other teacher gift ideas. Have a great Saturday!